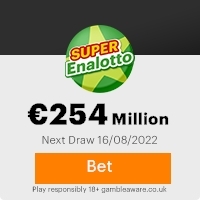 We wish to congratulate you over your email success in our Euromillion computer balloting sweepstake loteria held on 20th of June 2007. This is a millennium scientific computer game in which email addresses were used. It is a promotional program aimed at encouraging internet users,therefore you do not need to buy ticket to enter for it. You have been approved for the star prize of 700,000.00 Euro. (Seven Hundred Thousand Euro) CONGRATULATIONS!! You must contact the appointed agent with your Full Names, Contact Telephone Numbers (Home, Office and Mobile Number and also Fax Number) via email to process the immediate payment of your prize.The certificate is your legal prove/guarantee which will be submitted to the bank for the remittance of your fund. The Validity period of the winnings is for 12 working days hence you are expected to make your claims immediately, any claim not made before this date will be returned to the MINISTERIO DE ECONOMIA Y HACIENDA as unclaimed. Previous: Important Account Notice!Fresh ScamsNext: Account secure confirmation! This Email with the Subject "Mrs Gloria Blaze" was received in one of Scamdex's honeypot email accounts on Thu, 21 Jun 2007 11:54:04 -0700 and has been classified as a Generic Scam Email. The sender shows as "infon-ifinmail2@terra.es" <infon-ifinmail2@terra.es>, although that address was probably spoofed. We recommend that you do not attempt to contact any persons or organizations referenced in this email, as you may expose yourself to scammers and, at the very least, you will be added to their email address lists for spam purposes.